Denise Kiernan’s book, The Girls of Atomic City, is a New York Times, Los Angeles Times, and NPR bestseller, and was named one of Amazon’s Top 100 Best Books of 2013. Kiernan has been published in The New York Times, The Wall Street Journal, The Village Voice, Ms. Magazine, Reader’s Digest, Discover, and many more publications. She has also worked in television, serving as head writer for ABC’s Who Wants to Be a Millionaire during its Emmy award–winning first season and producing for media outlets such as ESPN and MSNBC. 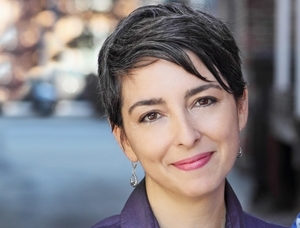 She has been a featured guest on NPR’s “Weekend Edition,” PBS NewsHour, MSNBC’s Morning Joe, and The Daily Show with Jon Stewart. 1. Denise Kiernan explains in an author’s note, “The information in this book is compartmentalized, as was much of life and work during the Manhattan Project.” (page 18) How does the book manage to recreate the workers’ experience of months-long ignorance, and the shock of finding out what they were working on? 2. Consider the losses of lives, land, and community that resulted from the Manhattan Project. What were some of the sacrifices that families and individuals made in their efforts to end the war? How do these losses compare to the gains of salary, solidarity, and peace? Do you think the ends of the Project justify the means? Why or why not? 3. Discuss the role that patriotism played in everyday life during World War II. Do you think Americans today would be willing or able to make the same sacrifices—including top-secret jobs, deployment overseas, rationed goods, and strict censorship—that families of that era made? Why or why not? 4. Consider the African-American experience at Oak Ridge. What kinds of discrimination did Kattie and her family face? How did Kattie manage to make the best of her substandard living conditions? What role do you think race played in the medical experimentation on Ebb Cade? 5. Helen was recruited to spy on her neighbors at home and at work. Discuss the ethical implications of this request. Was it fair, necessary, or wise to ask ordinary workers to spy? Why do you think Helen never mailed any of the top-secret envelopes she was given? 6. Although the Clinton Engineer Works was, in many ways, a tightly controlled social experiment, the military didn’t account for women’s impact on the community: “a sense of permanence. Social connectivity. Home.” (page 135) Consider the various ways that the women of Oak Ridge tried to make themselves at home. Which of their efforts succeeded, and which failed? Why were some women so successful at making Oak Ridge home while others were not, were depressed, looked forward to leaving? 7. Consider the legacy of President Truman, who made the decision to use atomic weaponry for the first time. How do Americans seem to regard Truman’s decision today? How does Truman’s legacy compare to other wartime presidents, such as George W. Bush or Lyndon B. Johnson? 8. 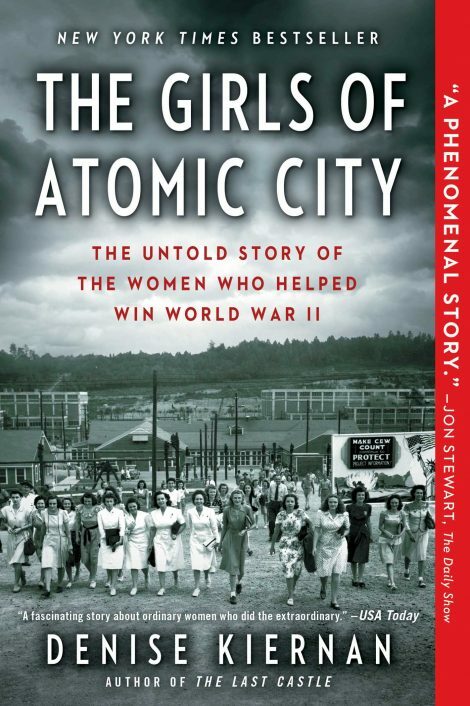 “The most ambitious war project in military history rested squarely on the shoulders of tens of thousands of ordinary people, many of them young women.” (page 159) Compare how The Girls of Atomic City contrasts “ordinary people” to the extraordinary leaders behind the atomic bomb: the General, the Scientist, and the Engineer. Are the decision-makers portrayed as fully as the workers? Do the workers get as much credit as the leaders? 9. Kiernan sets The Girls of Atomic City entirely in the past, recreating the workers’ experiences from her interviews with the surviving women. How would this book have differed if the interviews from the present day were included? Does Kiernan succeed in immersing us in the era of World War II? Explain your answer. 10. Among the workers at Oak Ridge, whose story did you find most fascinating? Which of these women do you think Kiernan brought to life most vividly, and how? 11. Discuss the scenes in the book that take place far from Oak Ridge, Tennessee: scientific discoveries in Europe, secret tests in New Mexico, political meetings in Washington, and post-atomic devastation in Japan. How does this broad view of the bomb’s creation and aftermath enrich the story of wartime life in Oak Ridge? 12. Discuss how various contributors to the Manhattan Project felt about the use of the atomic bomb, including General Leslie Groves, J. Robert Oppenheimer, Albert Einstein, and Harry S. Truman. What regrets did they express about the bomb’s results, if any? Do you think a weapon of that magnitude could or should be used in present-day warfare? Why or why not? 13. Kiernan writes, “The challenge in telling the story of the atomic bomb is one of nuance, requiring thought and sensitivity and walking a line between commemoration and celebration.” (page 412) What lasting contributions to society have come out of Oak Ridge, Tennessee? Why is it difficult to celebrate or commemorate the work that has been done in that secret city? Please tell us how you came to write about the women of Oak Ridge, Tennessee. When did you first learn about the ordinary people behind the atomic bomb? I was working on another project, a book for the Smithsonian about chemistry. While doing research, I came across one of Ed Westcott’s (“The Photographer”) photos of the women working the calutron panels at Y-12. It was in a Y-12 newsletter and was accompanied by a short piece about one of the women in the picture. In that one, little article that I had accidentally stumbled across online, I learned there was a town built by the government for World War II, 75,000 people lived there, many were single women fresh off the farm and the vast majority had no idea they were working on the atomic bomb until it dropped over Hiroshima. Then I realized the town was a mere two-hour drive from my house. The more I read, the more I became hooked. Tell us about your research process. How did you find the women you interviewed? What other archives and sources were essential to your research? After I was sure that there was a story here that hadn’t already been told to death, I began reaching out to people. I started with the man who spearheaded the Y-12 history efforts, the one who had written that first article I came across online. He first brought me to meet a man named Connie Bolling, then 101, who was a Y-12 supervisor. While I was waiting in the lobby of his assisted living facility, I met Dot and Colleen. They introduced me to people they knew. This became a pattern. Everyone I met introduced me to another “old timer” from the war days. The more research I did, the deeper I dug. I scanned as many personal documents as possible from the women and men I interviewed. I started making trips to the National Archives in Atlanta, which is home to the vast majority of all Manhattan Project and Atomic Energy Commission documents. I got oral histories from the Smithsonian and document collections from UCLA and military records for some of the family members. I find with stories like this that there are several elements that you work to line up: Individual memory, collective memory of a community, primary source documents, media coverage from the time period, and of course books and reports. Sometimes what people believe beyond the shadow of a doubt isn’t always totally accurate, and the same goes for the stories that a community tells over and over the same way. You have to come at things from as many different angles as possible and hope you’re covering all your bases and telling the most balanced story possible. You mention in your endnotes that it was extremely difficult to choose which women to feature in your book. (page 415) How did you ultimately decide? Are there certain stories that you regret leaving on the cutting room floor? A combination of factors play into this. First, when dealing with such an aged population, some people were ruled out because their memories were very limited. There were a few things that they remembered well that were very interesting, but beyond that, they didn’t have much more to add. I wanted women who not only had one or two good anecdotes but what I felt to be an engaging experience overall that could be carried through the book. Some women had great stories but arrived right at the end of the war, in spring or summer 1945, and I didn’t think that would work. I wanted a balance of work experiences, as well. I wanted women from K-25 and Y-12. I wanted women who worked in administrative posts. I wanted to be able to show as much of the town as possible through the eyes of the characters, so those women could not all work at one plant. I could have had all the women come from Y-12, and that is one way to do a book like this. But it’s not what I chose to do. And, finally, some of my decisions of who to use and who not to use was based on my personal chemistry with the interviewees. Please talk about the structure of The Girls of Atomic City, which reflects the secretive policy of “containment” within the Manhattan Project. How did you decide to narrate the book in this way? What were some challenges in explaining the bomb without actually naming it until the final chapters? I was fascinated by the fact that people were so committed to what they were doing that even those who knew they were working with uranium never used that word. The language censorship—maybe because I started out in journalism—was particularly interesting to me. I also wondered what it would be like to live in that kind of world, a world of letters and numbers that you knew were important but didn’t know why they were important. I wanted to try to recreate that, capture that feeling of “not knowing” experienced by the women and others. There are countless books and movies devoted to World War II history. Why do you think readers are perennially interested in this period? What new perspective on the war does The Girls of Atomic City provide on the era? I think World War II on many levels made some sort of sense to people. We were attacked at Pearl Harbor. European countries—our allies—were being overrun. Unfathomable atrocities were being committed. That war touched so many lives. EVERYONE knew someone who was away at war and it permeated life in the United States, from the draft and rations to music and films. Everyone felt affected, whether or not they were fighting. American culture was submerged in that event during those years. Those people who lived through the war and the children of those who lived through the war are still alive, and I think the desire to understand as much of that period of time as possible remains. What I hope The Girls of Atomic City adds to literature about that era is a look at one of the most significant—if not the most significant—scientific developments of the 20th century from the perspective of those who were not a part of the decision, those who were not privy to all the facts, people who were just trying to do the best for themselves, their families and their country. Many times history focuses on those in charge, and I think there is great value to the stories of “the others,” people who happened to find themselves in the midst of remarkable moments in time. They add an important layer to historical events that should be examined and shared. The development and use of atomic bombs during World War II is still a controversial subject. Did you have trouble maintaining an objective point-of-view as you were writing this book? Did your perspective on the ethics of the bomb shift over the course of your research? I doubt the debate about whether or not the bomb should have been dropped will ever end. I encountered people who felt very strongly that it should have been and people who felt very strongly that it should not have been. What I tried to focus on was how they felt then. We, today, know what the bomb is and what it’s capable of. Many people, on that day, when they heard about the bombing of Hiroshima, didn’t have that reservoir of knowledge about nuclear weapons. The words “fallout” and “nuclear winter” were not a part of common language. But that soon began to change. I tried as hard as I could to understand how they felt at that time about the events and not bring my own understanding to their memories. The Girls of Atomic City presents complex scientific concepts, such as nuclear fission, in a clear and lucid way. What challenges did you face in learning and writing about the science behind the atomic bomb? I’m a little lucky in that respect in that I have a bachelor’s degree in biology, a master’s degree in environmental conservation education, and took a fair amount of chemistry and physics along the way. So, I wasn’t starting completely from scratch. That said, college was a long time ago and I’m no nuclear physicist by any stretch of the imagination. There are two steps: first, I have to understand the topic as deeply as possible, much more in depth than I would ever share with the general public. Then I have to winnow it down to the most understandable language. Enough to communicate the most important concepts without getting too confusing. Earlier drafts of the book had a lot more science that I gradually simplified throughout my revisions. But it was definitely one of the more challenging aspects of the book. One important theme of The Girls of Atomic City is the inequality that women and minorities dealt with on a daily basis. Were the women you interviewed bitter about their treatment in the past, or did they remember the wartime years fondly? I didn’t encounter a lot of bitterness. If people complained about anything it was the food. Jane was already annoyed at not being allowed to matriculate as an engineering student, so it was little surprise to her that men beneath her were getting paid more. She didn’t like it, but it didn’t override her fondness for the experience. People like Kattie and other African Americans I interviewed were certainly not happy with their treatment. However, most of them were already living in the south before coming to Oak Ridge and were likely facing similar discriminatory practices back home. That didn’t justify the treatment in their eyes, but it wasn’t really a complete shock, either, except where the children and spouses were concerned. Not being able to have your children with you or be with your spouse was probably the biggest issue, the one that caused the most bitterness. But many still have some fond memories from their days in Oak Ridge. Again, I have found that this was not a generation of complainers. From ordinary workers to brilliant scientists, there are plenty of women from this period who have been forgotten in popular history. Why do you think these stories are important to tell? Do you think readers today are fully receptive to women’s histories? I think women’s roles, big and small, provide an added perspective to any historical event, and if history is to be as completely and accurately told as possible, all possible perspectives and experiences must be included. Their stories also serve as an inspiration to young women making decisions about careers and choices available to them today. I think readers are more receptive today than they were in the past, but I look forward to the day when women’s roles in history are not looked at as anything unusual or extraordinary. A woman helped discover fission? So what? Of course she did. What’s so unusual about that? That’s the reaction I still look forward to. You previously published books about the men who signed the Declaration of Independence and the Constitution. What was it like to write about a much more recent period of history in The Girls of Atomic City ? There are certainly more documents I can get my hands on writing a book about World War II. The biggest plus is being able to speak directly to the people I’m writing about, and not rely on interviews conducted by others. Being in the same room with someone makes a big difference; conversations with the people who actually lived through what you’re trying to describe cannot be beat. “All in the same boat” is possibly the most oft repeated phrase I heard while conducting interviews for this book, from both men and women.” (418) Why do you think the men and women you interviewed used that phrase so frequently? What does it capture about that time and place? What’s interesting about that phrase is that it’s not entirely accurate. Certainly Kattie was not in the same boat as the others. Those living in the trailers and huts—white and black—were not in the same domestic boat as those in the prefab houses or even dorms. But they were all subject to rations, they were all riding the same buses, they were all trudging through the mud, and they were all waiting for the war to end. The war was the biggest boat of all. Imagine you were a worker at the Clinton Engineer Works. What job do you think you’d be best suited for? What kinds of work do you think you would have enjoyed the most and least? I think I would have liked to be one of the dorm marms. I imagine it would have been fantastic to watch all the different comings and goings of so many young women on their own for the first time. Any job featuring rote repetition, where I would have had to suppress my curiosity—the majority of factory work—would not have been a good fit for me. What is the significance of this story today, in your view? What can we learn from the workers, scientists, and politicians behind the atomic bomb? Many people know very little about the development of the atomic bomb, despite the fact that nuclear weapons and nuclear energy play a significant role in our lives today. I hope presenting this story in an accessible manner will help fill some gaps in people’s knowledge about that period and that particular scientific development. I think it is interesting to examine the willingness of most Americans, from factory workers to members of the media, to get on board with whatever the American government asked of them. There was a trust in our leaders that is hard to find today. I am not saying one era is better than the other, but that the difference in and of itself is interesting to explore. Whether or not you agree with the outcome, the tremendous amount that the Manhattan Project accomplished in such a short amount of time—just under three years—is astonishing. It makes you wonder what other kinds of things could be accomplished with that kind of determination, effort, and financial and political support. What if the kind of money, manpower and resources that went into the Manhattan Project went to the fight against hunger? Cancer? Homelessness?